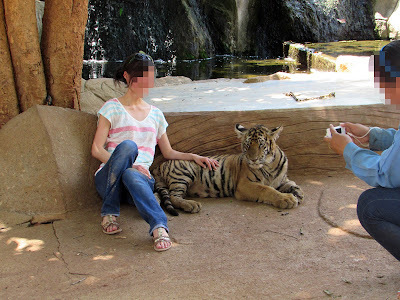 "Tourists need to be aware that their once in a lifetime opportunity to get up close to a tiger causes a lifetime of suffering. A selfie with a tiger is cruel, so don't do it." An investigation by international animal welfare charity World Animal Protection has exposed that Thailand's controversial Tiger Temple Co. Ltd. is planning to re-open under the new name Golden Tiger (Thailand) Co. Ltd. Since January 2017, World Animal Protection has written two letter to the DNP to not issue a license to the Golden Tiger Co. Ltd and impose a breeding ban. Read the charity's report about Thailand's tiger entertainment industry. Visit World Animal Protection's campaign site for more information on wild animals used for tourist entertainment.